When you think of a summer beach read, you probably think of lightweight romances or page-turning thrillers. But we’ve got a new idea—especially if you’re struggling with debt. Here are seven books we recommend adding to your summer reading list. 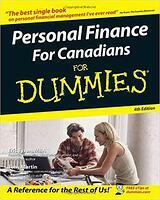 You’re probably familiar with the For Dummies books—today there are nearly 2,000 titles and over 300 million in print. The series has tackled just about every topic, from car repair to fine wine. For those who’ve never picked one up, the books are written by experts but injected with a sense of humour along with imagery to make the material more digestible. Now in its 4th edition, this one doesn’t break the mold. This friendly guide provides the information you need to take control of your finances, regardless of your income level. It covers ways to get out of debt, how to budget and save money, ways to reduce your spending, how to make profitable investments, and much more. 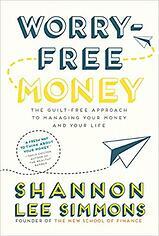 If you want to learn how to really deal with your money and debt and you love common sense with a side of sass, than look no further—Shannon Lee Simmons is your girl. She's the founder of The New School of Finance and in Worry-Free Money, she cuts through the "shame and blame mentality" of debt with a combination of good old-fashioned logic and a fresh perspective on what really motivates our decision-making when it comes to money. Her book discusses how being broke and feeling broke can seem the same yet are two very different things, and why not knowing what we can (and can't) afford makes every purchase feel terrifying. If you're looking for a quick read, fantastic tips, and a new, positive perspective about money and spending, add this to your list. Okay, here's something a little different: A cookbook full of money-saving recipes, complete with a list of ingredients, utensils you'll need, and serving sizes. 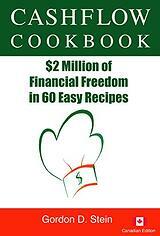 Cashflow Cookbook is the brainchild of Gordon (Gord) Stein where he gathers the best-of-the-best money-saving tips that are practical and applicable, and can be started by anyone today. From how to save money when driving to negotiating cheaper rates with service providers (it's a 60-minute phone call that could save you hundreds of dollars a year...not too shabby), Gordon breaks it all down to show you the different areas of your budget where you can save. So let's say you have a goal to add an extra $500 to your budget; you can just flip through this book, choose a couple recipes, and presto! You've got your extra $500. 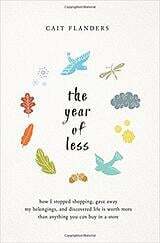 The Year of Less comes with a subtitle that tells you everything you need to know about the book: “How I Stopped Shopping, Gave Away My Belongings, and Discovered Life Is Worth More Than Anything You Can Buy in a Store.” As a carefree twenty-something, British Columbia-native Cait Flanders splurged on partying, buying furniture, and an expensive car. Eventually, she found herself over $30,000 in debt and became determined to rid herself of the burden. For 365 days, Flanders saved money by buying only the necessities, selling 70% of her belongings, learning to fix things instead of buying new things, and banning herself from television and alcohol. The Year of Less documents her journey, where she learns that the less she consumed, the more fulfilled she felt. Get inspired and maybe discover a path to less for yourself with this breezy read. Meet Mike and Rachel. They are nearing the age of retirement and struggling with many of the issues seniors or soon-to-be-seniors may be facing. This book lets you be a fly on the wall throughout Mike and Rachel’s struggles and discussions with their financial advisor. This fictional couple is a composite of the many real people Gillespie, a veteran financial advisor of Vancouver-based Rogers Group Financial, has worked with over the years. He details Mike and Rachel’s walk through the five stages of retirement: Dreams, Reality, Transition, Adjustment, and Legacy. In doing so, Gillespie reveals how retirement is not something that happens when you turn 60 or 65; it’s a journey that should begin much sooner. 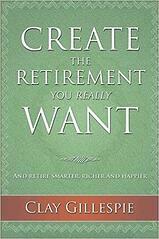 Whatever stage you’re at in life, this book may be what it takes to help you plan now, so you can enjoy your golden years later. At Credit Canada, we talk a lot about ways to live debt-free (there’s even an entire page on our website dedicated to it). Christine Conway also knows a thing or two about it. Writing based on her own experiences, she shares the frustration many feel regarding the seemingly impossible task of saving money while living—and trying to buy—within some of our nation’s most expensive cities. (Conway reports that even a tiny bungalow in Vancouver or Toronto can go for over $1 million!) 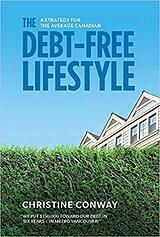 The Debt-Free Lifestyle presents a plan that the average Canadian can follow to pay down debt, avoid interest rate hikes on mortgages, and afford that bungalow. Despite being an accountant, David Trahair didn’t concern himself much with finances. And then his credit card was declined at an important business lunch. Embarrassing, but not surprising. 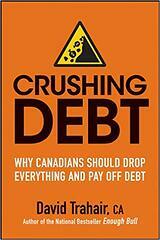 The average Canadian now has nearly $22,000 in non-mortgage debt, up almost 2% from the previous year. Learning from his own mistakes, Trahair details the evils of debt and how easy it is for it spiral out of control with real-life stories of debt disasters. If you are a Canadian who is already struggling with debt, Crushing Debt helps you face your financial problems while offering step-by-step solutions on just how to fix your situation.